Cam Kim Bike Tour – Tired of being hassled by sellers everywhere you go? Want to enjoy something new and unique? 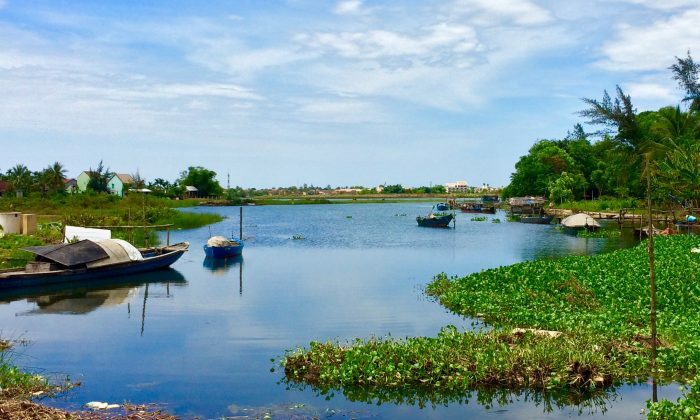 Cam Kim, a beautiful carpentry island which is about 10 minutes ride by ferry from the city, is a must when you are in Hoi An. A pleasant ride to Cam Kim will let you free from the busy life in the old town. 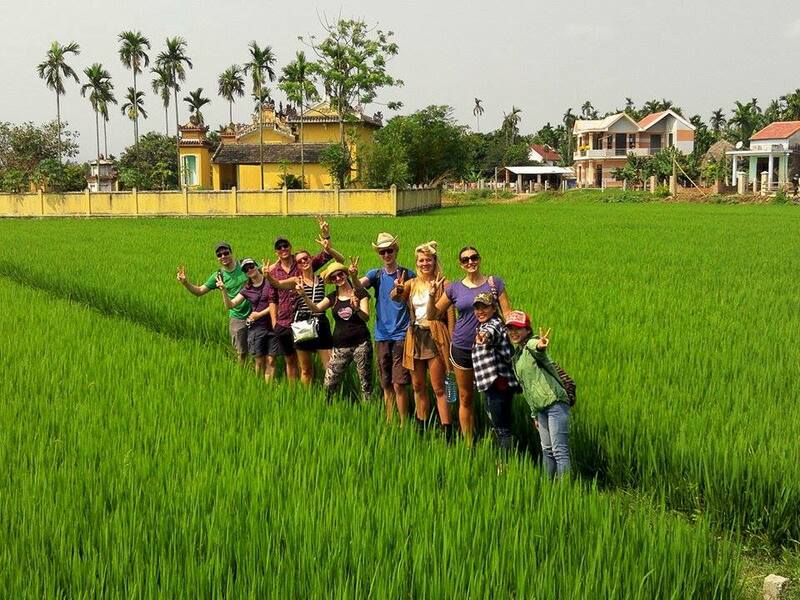 Instead of old buildings everywhere, you will enjoy stunning views of the countryside on Cam Kim island with beautiful rice paddies, cute water buffaloes, and friendly local people. This island is almost free of tourists and full of a chance for local culture explore. Kim Bong carpentry village has been famous for its skillful carpenters with various stuff made from wood: furniture, religious statues, finely crafted wooden doors, wooden toys and so on. 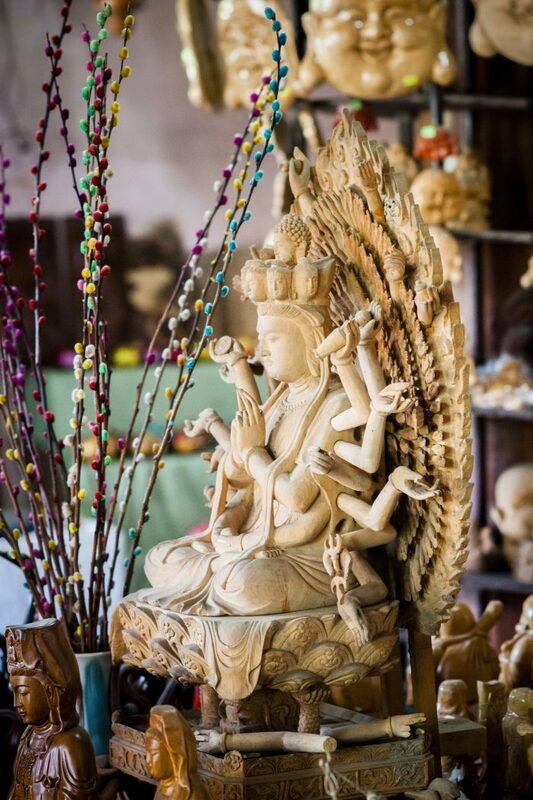 You will see how people here make this beautiful stuff by hands. No duvet or mattress, only sleeping mats are available in the countryside. Visiting this family to see how local people live here and trying to make a sleeping mat yourself are a nice experience you should have on this island. The ladies in the sleeping mat house are friendly and kind. They are happy to interact with you. 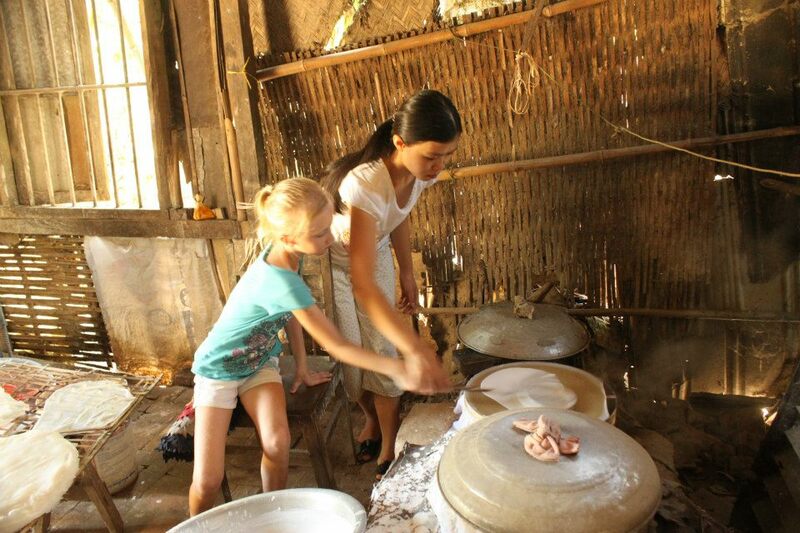 Don’t hesitate to ask them about their life and their culture. Vietnam is a religious country. Temples and pagodas are essential places for public worship. Let’s visit a family temple to have more knowledge about the architecture of Vietnamese temples as well as Vietnam history. Kids are cute and lovely everywhere. 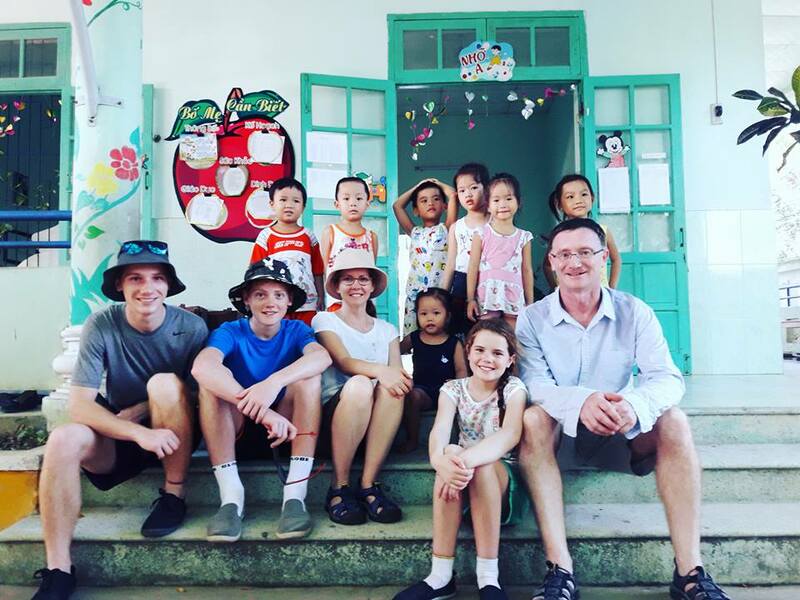 Let’s stop by a kindergarten/primary school and see how local kids here love seeing foreigners and love being photographed though the only word they know is “Hello”. We will have some fun games to connect with the adorable kids. What an experience! 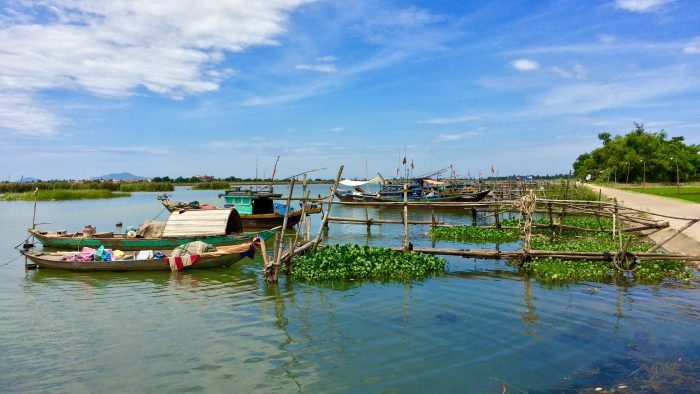 Have you heard about the seven – hectare water coconut woods with the unique ecosystem of water coconut trees- Cam Thanh village and be so fancy with Basket Boat? 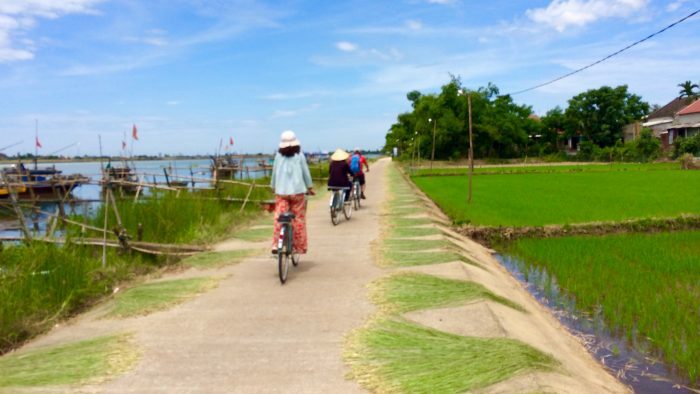 Now, with Cam Kim bike tour, you also have a chance to learn how the paddle the basket boat along the water on water coconut tree lake.